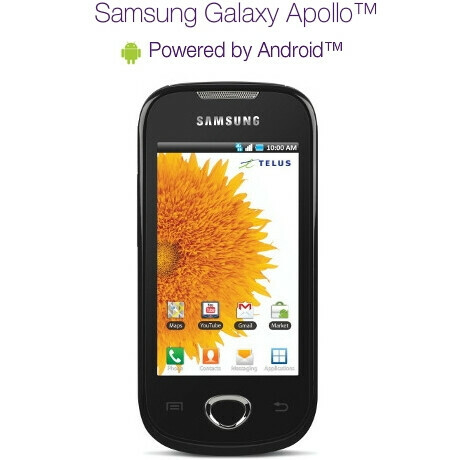 One would imagine that a handset bearing the name of a Greek and Roman god would bring forth some piercing notoriety, but since Apollo still sat in the shadow of other deities, the Samsung Galaxy Apollo is settling to make its presence known in the mid-range category over on TELUS. Supplementing their current offering with the LG Shine Plus, which is a variant of the LG Ally with Verizon, the Samsung Galaxy Apollo should pose to be a decent offering considering its specs. It features a 3.2” HVGA touchscreen, 3-megapixel auto-focus camera, Bluetooth, Wi-Fi, GPS, 2GB microSD card, 3.5mm headset jack, Swype keyboard, and running Android 2.1. Even though it might not get the admiration that's being garnered by the line of Galaxy S handsets out there, it should nonetheless prove to be an ideal solution for those looking for an Android powered smartphone that's budget friendly. Right now, TELUS is offering the handset for $249.99 no-contract, $199.99 with a 1-year contract, $149.99 with a 2-year one, and $49.99 with a 3-year agreement. If the latter price proves to be attractive enough for you, just be mindful that you'll be tethered with the carrier for 3 years – something that's pretty substantial; so maybe that no-contract price might prove worthy.